Time is money when it comes to staging an occasion, whether it is an Annual Sales Meeting, Christmas Party, or other Special Event. Corporate Events generally involve large numbers of people, and events held at hotels or conference centres in particular, require that your organization is in-and-out in the time booked. Delays can add unbudgeted costs due to time overruns. This is where an Official Town crier is invaluable: in managing people flow, especially during events with frequent breaks, where having attendees return to an auditorium or meeting room on time is a challenge. Time is money when it comes to staging an occasion, whether it is an Annual Sales Meeting, Christmas Party, or other Special Event. Corporate Events generally involve large numbers of people, and events held at hotels or conference centres in particular, require that your organization is in-and-out in the time booked. Delays can add unbudgeted costs due to time overruns. This is where an Official Town crier is invaluable: in managing people flow, especially during events with frequent breaks, where having attendees return to an auditorium or meeting room on time is a challenge. A Town Crier greets your attendees at the location at the start of the event. Announcing the purpose for the gathering in a unique and novel way, with an official "Oyez!" or "Hear Ye! Hear Ye!" the Crier quickly gets their attention. As your very audible and visible representative, when the bell subsequently rings, attendees know there's an announcement of some type. 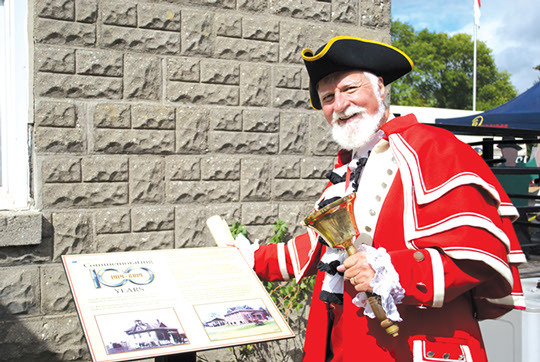 Whether it is a "10 minute break", “break for lunch," "please return to your place", announcement of a draw, or awarding of prizes, the Town Crier gets and keeps people moving and meetings on schedule. At the Special Event, the Town Crier can announce awards, read a declaration of thanks or other important pronouncements. The Town Crier can then ask the crowd to respect any particular wishes of the Hosts (ie. no smoking, hold questions till the end, etc. ), as well as announce the schedule of events (dinner, dancing, special events, photo opportunities, etc.) The Town Crier will then either introduce your master of ceremonies, or continue by announcing the next speaker. A Town Crier, as the Master of Ceremonies at your event allows all your organizers and attendees to enjoy the event. Includes attendance of an Official Town Crier in a clean, authentic, historically correct uniform at the location. Preliminary 2 hour consultation for content of the announcements/schedule of events. Reads congratulatory telegrams and e-mails that have been received. Announces any of your special requests. Announces each guest to the receiving line. Reads declaration of love from a personally crafted scroll. Circulates to each of the dinner tables for guest signatures. Presents autographed scroll to the bride and groom. Greet guests at the hall. Quiets guests and introduces the head table bridal party. Traditional Master of Ceremonies duties (toasts) after dinner from material provided by the bride and groom. Introduces D. J. or band and accepts requests. Calls special dances, door prizes, table prizes etc. Announces “Throwing of Bouquet” and “Removal of Garter”. Announces departure of bride and groom. Announces “Last call”, “Hall closing” and Thank you to guests”.